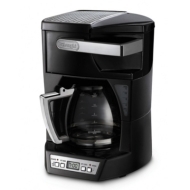 alaTest has collected and analyzed 66 reviews of Delonghi DCF212T. The average rating for this product is 3.9/5, compared to an average rating of 4.4/5 for other products in the same category for all reviews. Reviews about the durability and size are overall positive. The design and maintenance also get good feedback. We analyzed user and expert ratings, product age and more factors. Compared to other products in the same category the Delonghi DCF212T is awarded an overall alaScore™ of 79/100 = Good quality. I think DeLonghi did a pretty good job with this machine. Perhaps a stronger enamel paint on the warmer and a back lighted clock would make this machine is, in my opinion, be one of the best on the market. Brews nearly as good a cup of coffee as a Starbucks french press without the fussy cleanup. I paid full retail at Crate and Barrel and highly recommend this unit as a sweet spot price for value. Had mine for 2 months.